Galen Dara wrote a great article titled “The Taxman and the Artist”. It’s a must-read, especially for those (like me) who are new at the whole taxes/creative thing. John Skipp’s anthology DEMONS: Encounters with the devil and his minions, fallen angels, and the Possessed won the Bram Stoker Award for “Superior Achievement in an Anthology”. Skipp deserves everything in the world and more. I’m also especially delighted because my story “Daisies and Demons” is in the anthology. Yay! Want something cozy in your life? Search the phrase “yarn bombing”. It will make you smile, and gives a new sense to the phrase “tree hugger”. Not enchanted by the sweet little spring crafts that are popping up everywhere? Why not go to www.ravensblight.com and make some awesome, free paper crafts? 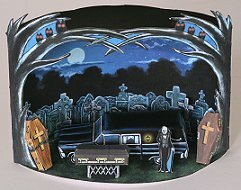 My favorite is the Original 13 piece Hearse Playset . Here’s a glimpse of it. Are you as charmed as I am? Timothy C. Ward ran a short, two minute snippet of our interview that will go up on Wednesday. You can listen to that here. He also created a #quotingmercedes hashtag if you want to add any bizarre phrases that you’ve heard me utter, which makes me laugh. My husband nominates yesterday’s pearl of wisdom, which was, “It smells like raped pig in here”. We were baking a ham. It made perfect sense at the time. I swear. Ha! See, that’s exactly why I made that hashtag. I made a @whatredheadsaid account for my wife for that same reason, but hers rarely fit on twitter, so I just post on facebook. She primarily uses it to see what people think about American Idol… So, did you do something wrong with baking the ham?? ?